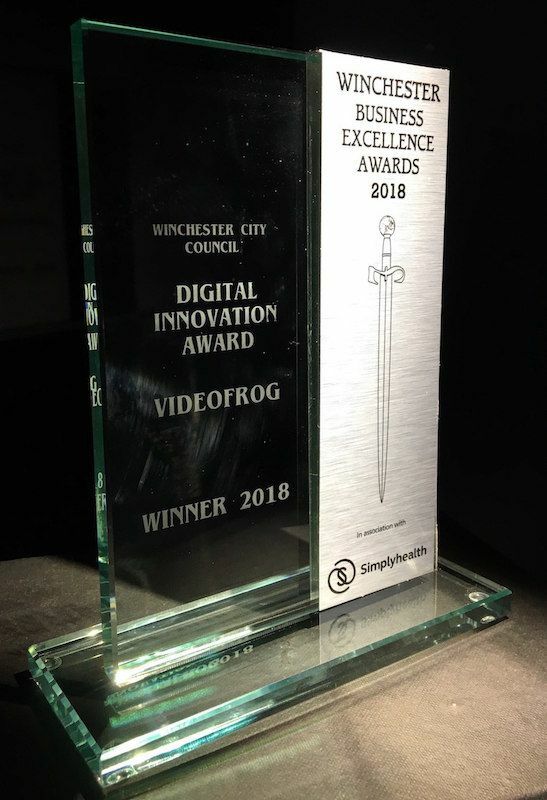 Home > About > Latest News > videofrog is a Winchester Business Excellence Award 2018 winner! With the event now in its 16th year and the ceremony attended by both Winchester based businesses, shortlisted businesses and sponsors of the event, Winchester BID, Hampshire Chamber of Commerce and Hampshire Chronicle plus SimplyHealth, it was a buzzing atmosphere at Guildhall Winchester! Listed alongside BioTeq, Asisters and Enterprise Car Club in the Winchester City Councils Digital Innovation award, we went to the ceremony to meet other nominated companies across all categories and have a lovely time. We were so pleased to be shortlisted and attending that we honestly had no consideration that we could possibly win, so listening to all the details being read out about the award, we did not expect for the name to be called out as ours! Slightly stunned we made our way up onto the stage and collected the award and certificate! As Buz explained, it’s amazing for us to win this award, and is more encouragement for us to continue to develop new technologies, while continuing to provide the very highest level of customer service. As part of the Whitwam Group and working alongside the other two sectors, designed. event production and Whitwam AV Integration, we continue to strive to keep this combination at the heart of our business and maintain our base in the wonderful city of Winchester. Not only do we push the technological aspect of our service, we always push ourselves creatively, so to be recognized by this prestigious event is amazing and gives us a boost to keep moving forward. If you would like to find out more about our team and the services we provide at videofrog we have specialised services pages and and our team page. We also have our blog, do check it out as it features lots of interesting pieces that can help you make better videos, and produce more stimulating content. We will be doing a piece on the blog this week more about winning the award and what how our digital innovation of live streaming made us a winner. If you’d like to talk to us about winning the digital innovation award, you can contact us via our contact page, or call us on 01962 870408.